been reported in 33 states, an increase of eight states since last fall. Well, we may have a new imported, invasive pest. The good news is that the control should be easy – and of course it’s organic. 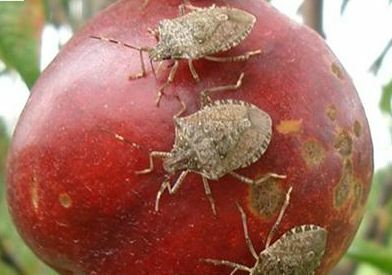 Officially known as the brown marmorated stink bug, sightings of the pest have been reported in 33 states, an increase of eight states since last fall, plus listeners reported on my radio show this past weekend that the insects are in Texas. The National Pest Management Association warned homeowners this week that the bugs' growing populations are likely to be large. First identified in the USA in the late 1990s in Allentown, PA, these Asian bugs have few natural predators in the U.S. because native enemies do not seem to recognize them as prey. For those bugs inside the house or office – vacuum them and throw in the trash. Outdoors, the prevention is to have an organic program and encourage birds, lizards, frogs, toads, beneficial insects and lots of good microbes. Trichogramma wasps should be released anyway for the control of various caterpillars, and they just might help with control of this pest. Outdoors the cure is to spray the killing organic pest control products. The options include orange oil-based products, neem products, Eco-EXEMPT products, PureGro Bug Stop and Garrett Juice with 2 oz. of orange oil added is a great foliar feed that works as an effective control for various pests. If you have any questions about this newsletter or any other topic, join me this weekend for my Green Dirt Doctor Radio Show s.